Artifical Joints - Artifical Joint 《TEIJIN_NAKASHIMA》 - Surgical Equipments&Implants - Product - The Industrial Promoting Co. Ltd.
Knee joint prostheses are mainly comprised of four components: femoral component, tibial base plate, tibial insert and patella component. 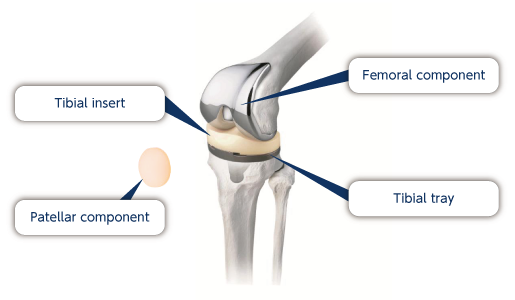 Knee joints are reconstructed by sliding the articular surfaces of femoral components and polyethylene tibial plates. Teijin Nakashima Medical has succeeded in reducing the wear volume of the tibial insert by applying a mirror finished to the sliding surface of the femoral component. Furthermore, we have reduced material deterioration of the tibial insert by adding antioxidant vitamin E to raw materials. What are “Joint Prostheses” ? 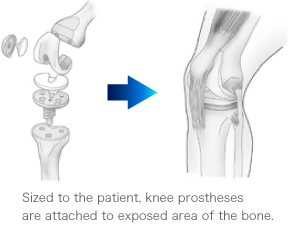 Joint Prostheses are artificial materials that are used for regaining primary function of deformed or damaged joints. It is expected that the replacement of damaged joints can reduce pain and enhance Activities of Daily Living (ADL) and improve Quality of Life (QOL). What are “Teijin Nakashima Medical’s Joint Prostheses” ? Teijin Nakashima Medical’s joint prostheses come in various sizes suited for Japanese and Asian people, and can be selected according to a patient’s bone configuration. Teijin Nakashima Medical has developed suitable materials and designs for each joint. A reduction of wear volume in the resin material is expected from mirror-polished metallic materials used for the sliding articular surfaces. Sized to the patient, knee prostheses are attached to exposed area of the bone. Osteoarthritis is a disease associated with a variety of factors such as muscle weakness, obesity, aging, etc. Progressive symptoms cause joint degeneration, which results in the development and progression of osteoarthritis. Symptoms may include joint pain and swelling in the knees, hips, elbows and shoulders. It occurs more frequently in females than in males, with age. Rheumatoid arthritis is a disease that causes inflammation, pain, swelling and stiffness in the joints. As the disorder progresses, it leads to joint degeneration and dysfunction.